It is time to get some Klout Klarity. In a search to find out if we are as important as we think we are we turn to sites such as Klout. When we don’t get the answer that we want (we aren’t as important as we hope to be) we then find the site’s weaknesses and bash Klout as a scoring system. In this posting we are going to look at the ways that Klout works. We understand there are ways to “game” the system and we will not cover those here. Every system has a flaw and someone will always find the way to work the system. If you just use Klout for what it is, you will find it useful and the future applications are powerful. It doesn’t matter if your score is 20, 30, 40 or higher. Use Klout to monitor your score and watch for it to climb or drop. If your score is climbing you improving in the area of engagement. If your score is dropping you are lacking in social engagement. Track this on a regular basis and continue with your success or halt your drop. Want to know what someone is talking about socially most of the time? Check out their Klout page and see the topics that they are influential in. Some people will have no topics and some will have many. These are the things that you can expect them to focus their social voice on. These last two things are great bonuses to Klout on top of everything else. There are many people out there that love their badges. From the Boy Scouts to the Foursquare users and Klout is no exception with their achievements. Check out what others have earned badges for and earn your own for giving +K, viewing profiles, reaching score plateaus and so much more. 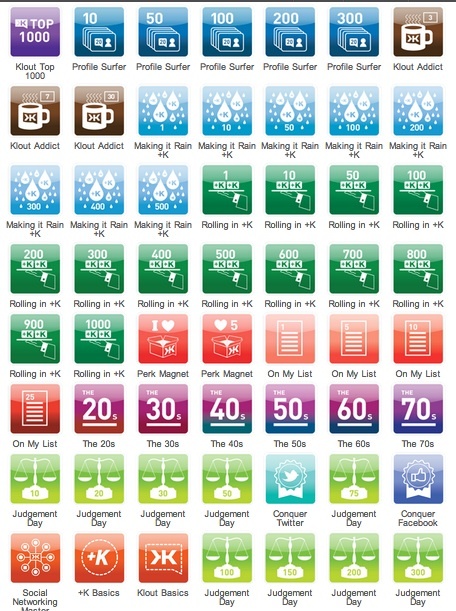 These badges are just a visual representation of what a user has achieved. Chadalyst – Check out your Klout score and set a goal for the next level you will reach on Klout and by when. Then go interact with people on social networks! Share in the comments below your current Klout score.